The many reincarnations of Stephen Sondheim’s Road Show that began with a workshop in 1999 called Wise Guys, then opened in Chicago in 2003 as Bounce, and later in New York in 2008 as Road Show, might reveal a story of the vagaries of business in and of itself. 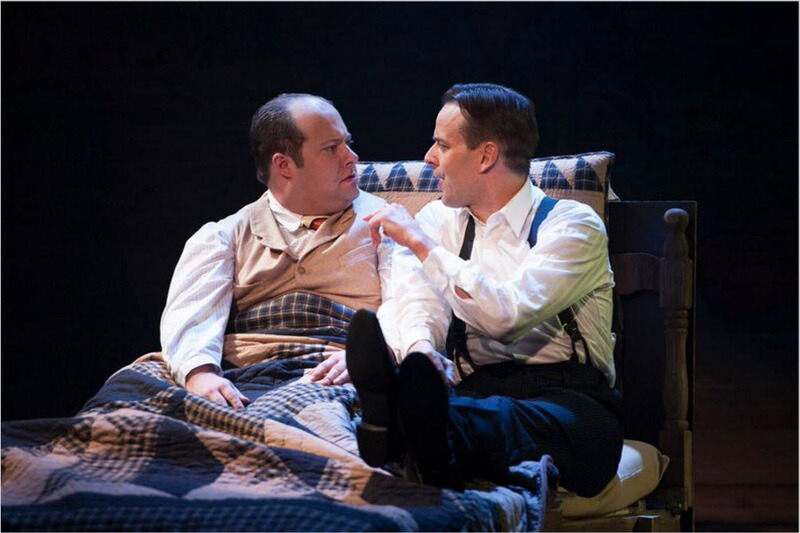 But it wouldn’t be half as juicy, nor nearly as fun as the tale of Addison (played by the rivetingly hilarious Josh Lamon) and Wilson Mizner (played by the captivatingly suave Noah Racey), the musical’s main characters. Determined to see his show get the attention it deserved after four scripts, three titles and two out of town tryouts, Sondheim thought he’d finally gotten it right. Now it’s up to us. But what’s not to like? Those who adore Sondheim will find his familiar chord changes and emotionally sophisticated lyrics in these eighteen numbers that take us from the brothers’ ordinary upbringing in California to a glamorous world of fame and fortune with all the trappings and pitfalls. Taking to heart their father’s dying words in the tune “It’s in Your Hands Now”, they set out to make their fortune – – at first in Alaska during the gold rush of the early 20th century – – where the brothers have the first of their many fallings out in a hilarious sleeping bag dust up and an emotional, and financial, parting of the ways. 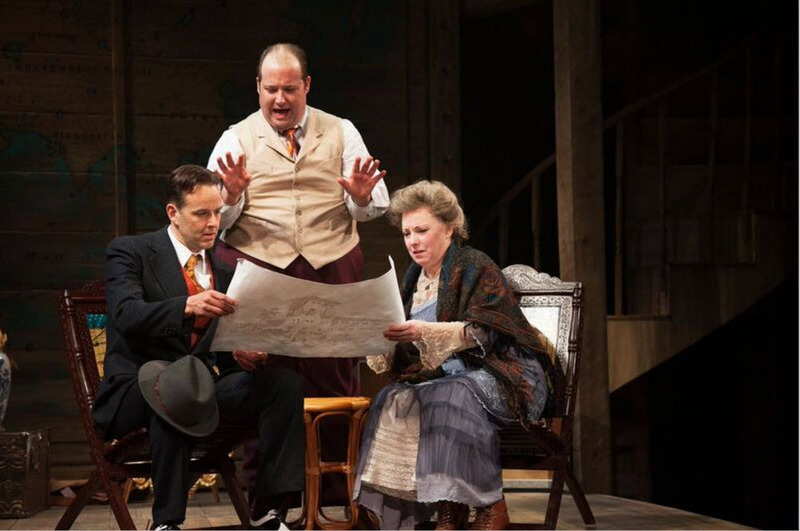 Noah Racey (Wilson Mizner), Josh Lamon (Addison Mizner) and Sherri Edelen (Mama Mizner) in Road Show at Signature Theatre. Photo by Margot Schulman. It’s a tale as old as Cain and Abel, here sprinkled with the glitz of Palm Beach and the high stakes world of real estate, driven by two ambitious brothers who co-opted Barnum’s hucksterism and Ziegfeld’s showmanship to craft an empire along Florida’s Gold Coast. 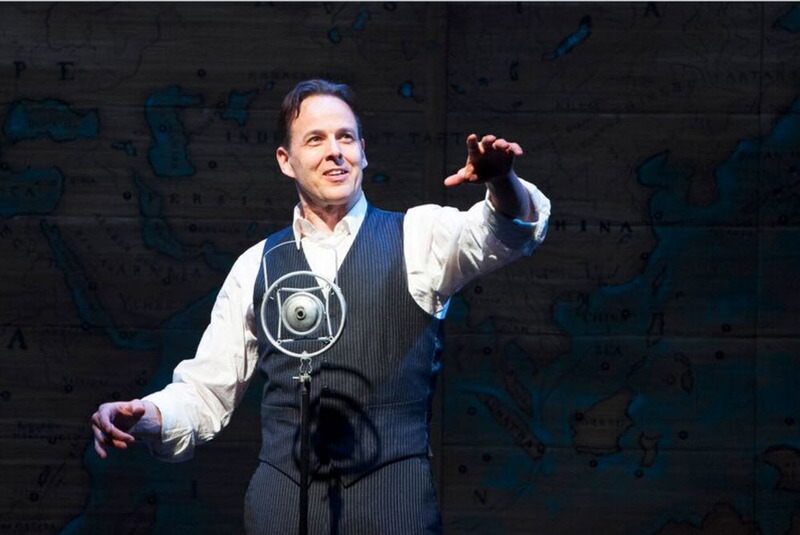 Noah Racey (Wilson Mizner) in Road Show at Signature Theatre. Photo by Margot Schulman. Director Gary Griffin sticks to a bland stage set of wooden planks, a ramp, and an underutilized second story flanked by winding staircases, its plainness redeemed by an excellent cast, hilariously quirky souvenirs from Addison’s risky ventures in far-flung outposts – – from Hawaii where he buys a share in a pineapple plantation that promptly burns down to India where his gem emporium succumbs to a hurricane, and Hong Kong where his fireworks factory blows up to a Guatemalan coffee plantation upended by a revolution – – and a story with a rib-sticking plot. When, after all his failed businesses, Addison returns home to his mother, played beautifully by Sherri L. Edelen, he is greeted by her immortalizing his ne’er-do-well brother in the song “Isn’t He Something”, which she sings to Addison from her death bed. Here’s a mother who clearly knows how to play two ends against the middle. Stefan Alexander Kempski (Ensemble), Angela Miller (Ensemble), Noah Racey (Wilson Mizner), Jacob Kidder (Pianist), Bobby Smith (Ensemble), Matthew Schleigh (Ensemble) and Erin Driscoll (Ensemble) in Road Show at Signature Theatre. Photo by Margot Schulman. 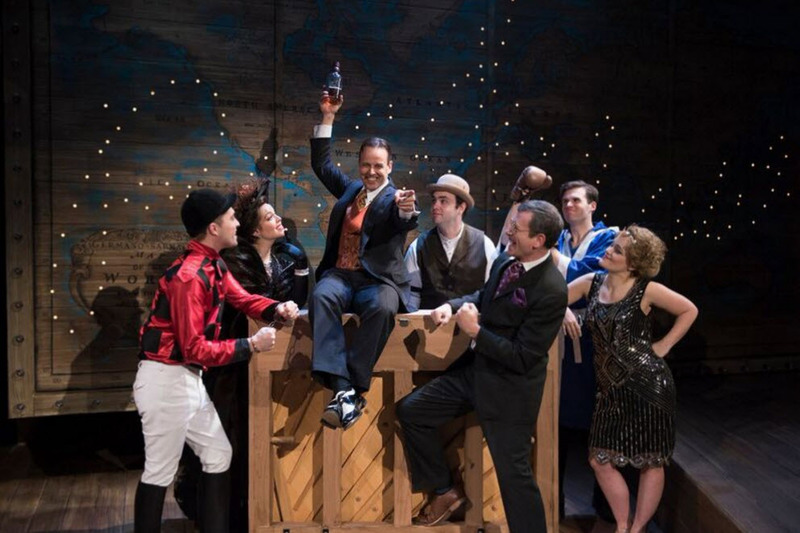 Eight other actors handily play a slew of roles – – Erin Driscoll, Dan Manning, Bobby Smith, Stefan Alexander Kempski, Jason J. Labrador, Jake Mahler, Matthew Schleigh, and Angela Miller with Jacob Kidder on upright piano onstage for the duration of the show. See it for Sondheim’s music, tons of laughs and a rollicking good tale of fame and fortune won and lost in the quest for the American dream. Through March 13th in the MAX at Signature Theatre (Shirlington Village), 4200 Campbell Avenue, Arlington, VA 22206. For tickets and information call 703 820-9771 or visit www.sigtheatre.org.